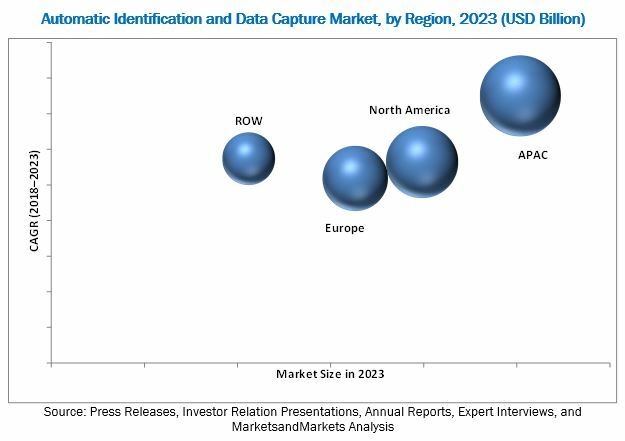 [178 Pages Report] The automatic identification and data capture market was valued at USD 35.69 Billion in 2017 and is expected to reach USD 72.00 Billion by 2023, at a CAGR of 12.30% during the forecast period. The base year considered for the study is 2017, and the forecast period is between 2018 and 2023. Factors such as rising government regulations and growing opportunities from supply chain management and healthcare industries are expected to support the growth of players in the automatic identification & data capture market. The objective of the report is to provide a detailed analysis of the automatic identification and data capture market based on product, offering, vertical, and geography. The report provides detailed information regarding the major factors such as drivers, restraints, opportunities, and challenges influencing the growth of the market. It also provides a detailed overview of the value chain pertaining the market for automatic identification and data capture system. The research methodology used to estimate and forecast the automatic identification and data capture market begins with capturing data on key vendor revenues through secondary sources such as Aim Global, AIDC Technologies Association of India, Barcode Standards Organizations, the International RFID Business Association, APSCA, European Association for Biometrics (EAB), and press releases, investor relation presentations, and annual reports of companies. Vendor offerings have also been considered to determine the market segmentation. The bottom-up procedure has been employed to arrive at the overall size of the global automatic identification & data capture market from the revenue of the key players. After arriving at the overall market size, the total market has been split into several segments and subsegments, which have been verified through primary research by conducting extensive interviews with experts such as VPs, directors, managers, and executives. The market breakdown and data triangulation procedures have been employed to complete the overall market engineering process and arrive at the exact statistics for all segments and subsegments. The breakdown of the profiles of primaries is depicted in the following figure. 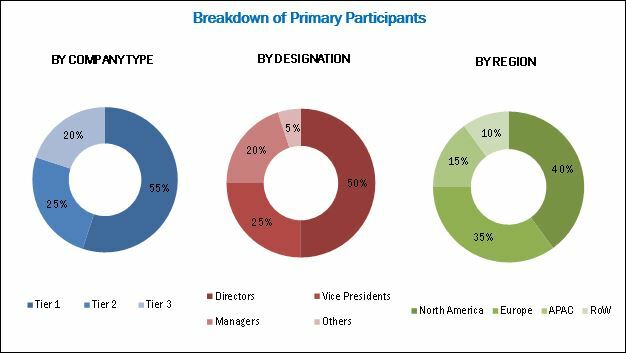 The automatic identification & data capture market comprises component manufacturers, system integrators, and distributors. Some of the major players that manufacture and develop automatic identification and data capture solutions are Datalogic (Italy), Honeywell (US), Zebra Technologies (US), SICK AG (Germany), Cognex (US), Toshiba (Japan), NEC (Japan), NXP (Netherlands), Synaptics (US), and SATO (Japan). In this research report, the overall automatic identification and data capture market has been segmented on the basis of product, offering, vertical, and geography. Country-level segmentation of automatic identification and data capture market in Europe by Germany, the UK, and France. The automatic identification and data capture market is likely to grow from USD 40.31 Billion in 2018 to USD 72.00 Billion by 2023, at a CAGR of 12.30% between 2018 and 2023. The growth of the market is propelled by the growing e-commerce industry, rising use of smartphones for QR code scanning and image recognition, and increasing adoption of automatic identification and data capture solutions by financial institutions. Factors such as the rising government regulations and growing opportunities from supply chain management and healthcare industries are expected to provide lucrative opportunities for the players in the automatic identification and data capture market. The automatic identification and data capture market has been segmented on the basis of offering, product, vertical, and geography. Smart cards held a larger share of this market by product type in 2017 . The leading position of smart cards, in terms of market size, can be attributed to its several application areas, including identification, health cards, public transit, ATM cards, credit cards, fuel cards, and security tokens. Among all offerings, the automatic identification and data capture market for services is expected to register the highest CAGR between 2018 and 2023. Frequent requirements related to repair and installation services, and technical and training support drive the growth of the market for services. The high deployment cost of automatic identification and data capture solutions is restraining the growth of the automatic identification & data capture market. Top companies such as Datalogic (Italy), Honeywell (US), Zebra Technologies (US), SICK AG (Germany), Cognex (US), Toshiba (Japan), NEC (Japan), NXP (Netherlands), Synaptics (US), and SATO (Japan) have adopted the strategies of partnerships and contracts to strengthen their position in the automatic identification & data capture market. Datalogic has adopted organic growth strategies to strengthen its position in the automatic identification & data capture market. In January 2018, the company launched Jade X7, an automated scanning portal integrated with RFID having applications for retail stores. Similarly, in November 2017, the company launched handheld scanners through its PowerScan 9100 series.